It's almost full-throated, stop at every farm stand, butter and salt dripping down your wrist, stuck between your teeth corn-o-copia time in Minnesota. Corn on the cob recalls the best summer meals and memories; steak, burgers or fish you or your sister or your dad caught in the lake and fried in a big skillet served alongside perfect corn and sliced tomatoes with black pepper and salt from the glass shaker on the table with grains of rice in it to keep the salt from caking and refusing to pass through the holes on the lid. After dinner it's endless games of gin rummy or cribbage with a little baby powder sprinkled on the cards to keep them dry and able to shuffle properly, which is to say thoroughly because these are games of skill. Skill—never luck. This recipe is made with corn I got at the grocery store. 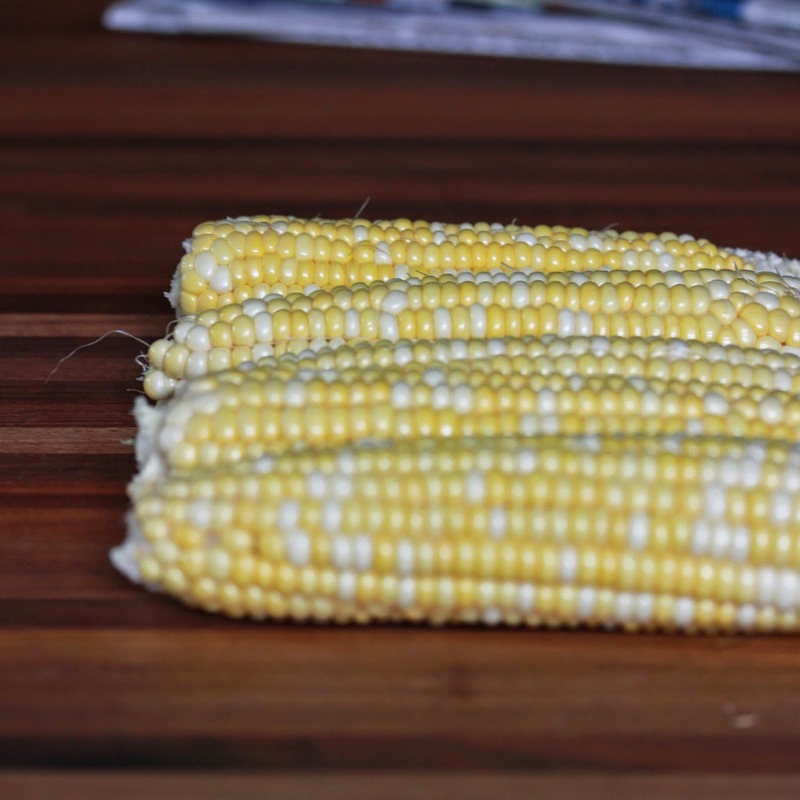 Not the perfect corn because it wasn't picked this morning and sold roadside in a paper sack or on a folding table outside the meat market by an older gent or kids sitting on lawn chairs looking like they have all the time in the world to sit and sell corn for a few bucks a bag. I left half of the corn raw and grilled the other half until slightly charred, sliced it off the cobs and combined it with a bit of red onion, red pepper, thinly sliced red cabbage, a spoonful of parmesan (feta or goat cheese would be good too) and a splash of punchy cumin vinaigrette. Great with grilled chicken on the side or cut into chunks and added to the bowl. 1. Heat grill to hot, rub three cobs with a little oil (vegetable or olive) and grill until charred in spots turning every few minutes (about 5 minutes total). Cool, then cut kernels from cob. 2. Cut kernels off remaining three cobs and set aside. 3. Combine corn with onion, peppers and cabbage. Top with cheese and dress lightly with Cumin Vinaigrette or serve on the side (it's good without dressing too). 1. Whisk garlic, vinegar, lemon juice, salt and mustard until combined then drizzle in oil and whisk or shake in a jar until combined.